The view we love so well: The Flatirons from the Chautauqua Meadow, June 2013. Hubley Archives. the three of us in the band used to fantasize about renting a villa in the Italian countryside and spending the sun-drenched Mediterranean days learning the Stax-Volt catalog. But in 2007, three years after the Turbines ground to a halt, Gretchen and I were at last able to realize our dream of making music in a beautiful place far from the distractions of home. 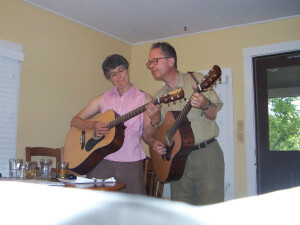 Gretchen Schaefer and Doug Hubley, aka Day for Night, learn a song in Boulder, Colo., in 2008. Hubley Archives. 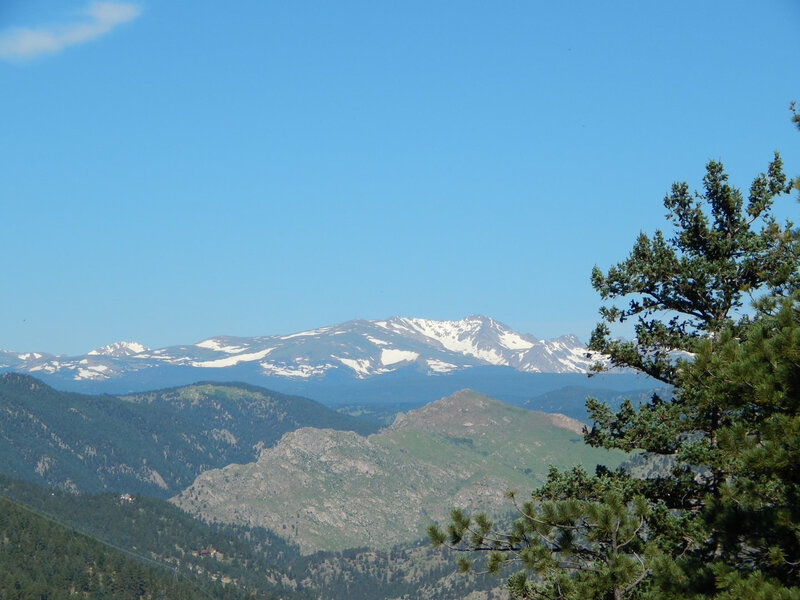 Heaven on earth for us is the Colorado Chautauqua, where since 2007 we have occasionally been able to spend a summer week or so — hiking, seeing the town and best of all, making music. Only on vacation are we able to dedicate as much time as we’d like to music, and Colorado has given us our best musical times by far. In fact, these Colorado sojourns have consistently helped us keep our focus as the country band Day for Night, and they continue to keep our set lists vital. Doug rocks out on the trail. Schaefer Studios. 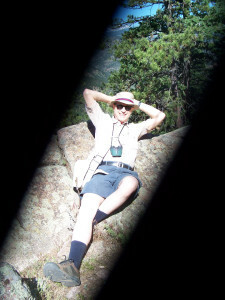 We found Colorado by accident, hopping to Boulder for a few days in July 2006 so Gretchen could attend a conference. She had first visited a friend there in the 1970s. 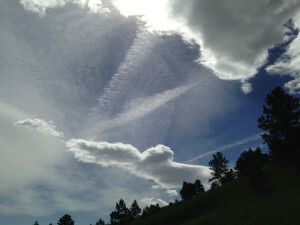 But I had never been interested in The Centennial State, scarred by any number of John Denver songs — not to mention Rick Roberts’s “Colorado” (he was a Flying Burrito Brother how and why, exactly?). Nevertheless, I was happy to tag along. We stayed at a crap motel near the University of Colorado campus. Gretchen had little chance to see the city at first, spending much of her time in a remote function room undergoing professional development. But I wandered around Boulder and surprised myself by liking it fine: the mountain views, the healthy happy people, McGuckin Hardware and the Dushanbe Tea House. Cottage No. 19 at the Colorado Chautauqua, June 2013. Hubley Archives. Still, the real Boulder conversion experience didn’t hit us until near the end of the trip, when we visited the Colorado Chautauqua. We had tickets for a Richard Thompson and Aimee Mann concert at the Chautauqua Auditorium. The morning of the show, we slogged up Baseline Road to the Chautauqua to get the lay of the land — and were smitten. What is this thing called Chautauqua? Named for the lake in New York state where it originated, the Chautauqua movement swept the nation in the 19th century, designed to effect self-improvement on a grand scale by means of rustic retreats replete with Nature, Fine Arts and Righteous Thinking. Welcome to Boulder. Hubley Archives. 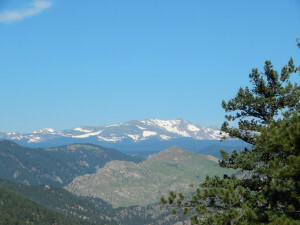 The Colorado Chautauqua was founded in 1897 as a mountain oasis for Texas schoolteachers. Following the standard model, the Boulder version was a self-contained community, with lodgings (tents in the first year; mostly tiny cottages thereafter), a dining hall, a barn-like auditorium and other historic and attractive buildings. Once an open field, the Chautauqua site today has matured into a leafy, sheltering hillside garden spot. Bunnies hop around and one takes precautions against bears. The Chautauqua remains a self-contained community, operated by the Colorado Chautauqua Association as a sort of resort that boasts fabulous views, good meals at the Dining Hall, a range of lodging choices and a strong offering of music, films and other entertainments at the Auditorium. 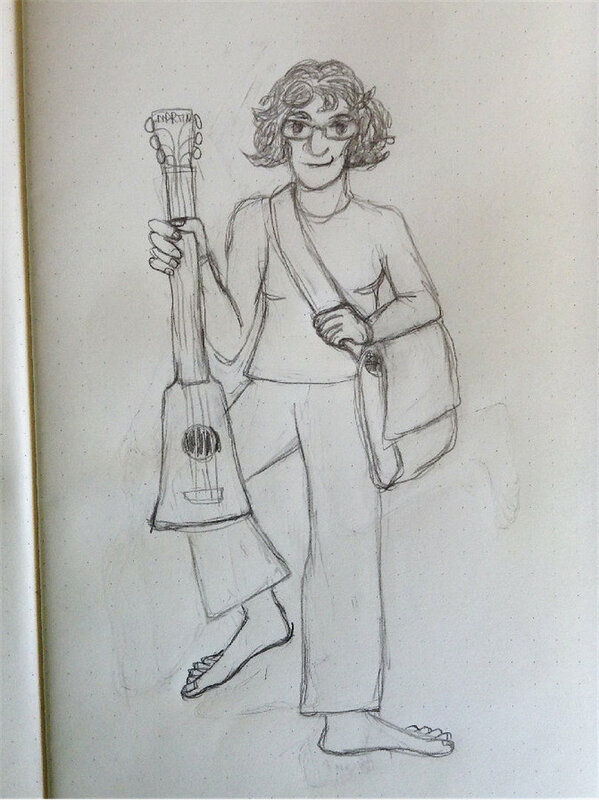 A sketched self-portrait for Gretchen’s 2013 travel journal. Schaefer Studios. 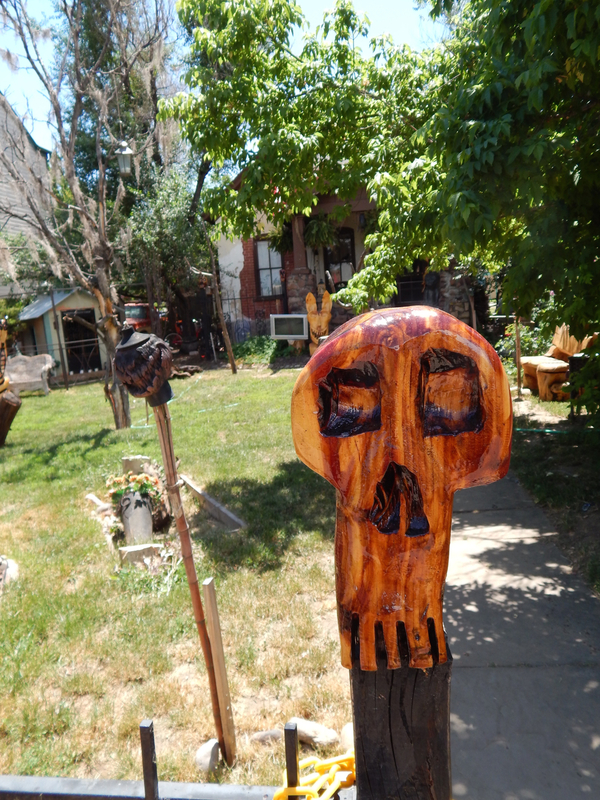 The compound is situated on a slope above and south of downtown Boulder. 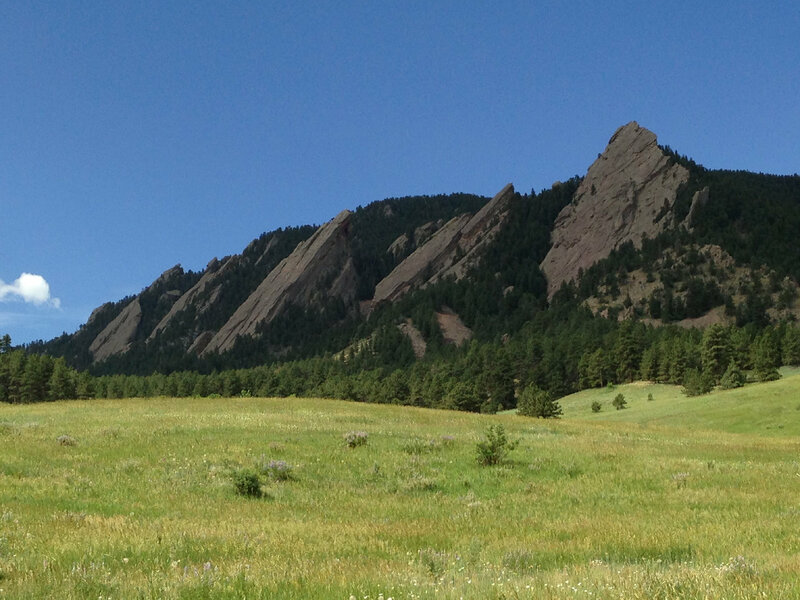 Dominating the view is the riveting and iconic row of five sandstone crags called the Flatirons, visible above the pines and across the grassy expanse of the Chautauqua Meadow. 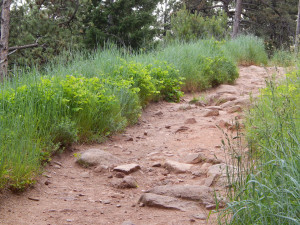 The Chautauqua is a nexus for several mountain trails, some of them accessible via an unpaved fire-access road that separates the Chautauqua compound and the meadow. The day of the concert we looked around the compound and ventured up the fire road a ways, oohing, aahing and gasping for breath. 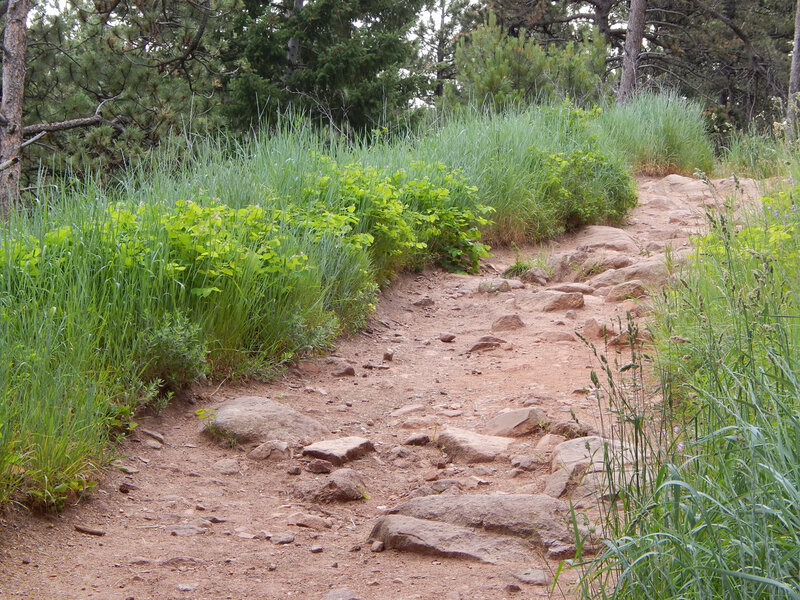 (The Chautauqua is about 6,000 feet above sea level and roughly 600 feet above downtown Boulder.) Lithe carefree young people and wise spry oldsters powered up and down the road and out across the meadow, not gasping. The orange dirt trail, 2015. Hubley Archives. So beautiful, the mountains! So blue the sky and so spacious. 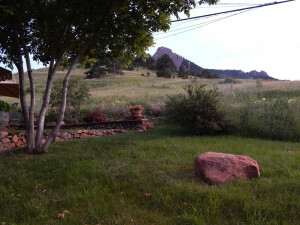 So charming, the tranquil Chautauqua compound with its trembling rabbits and shady lanes named for mountain flowers! So alluring, the century-old cabins with their dark woodwork and Black & Decker coffeemakers! And so rentable, as we soon learned. That night we enjoyed an excellent dinner on the Dining Hall porch and a half-excellent concert (Thompson, playing solo, was superior, aside from one song about his manhood that no one needed to hear; Mann was strangely lusterless). And then we hoofed it back down Baseline Road to the crap motel, in love with the Chautauqua. Getting acquainted with the Big Muddy, 2010. Schaefer Studios. The following year we stayed five or six nights in Chautauqua’s No. 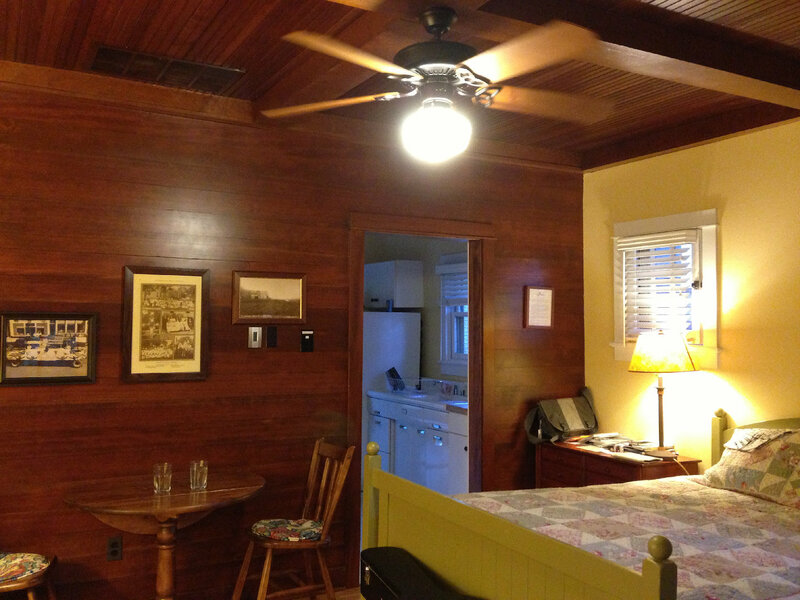 30, a relatively spacious cottage with backyard access to the meadow, fire road and the connecting trails. It starts with the trail. Boulder was our introduction, as a couple, to a style of hiking that was clearly on a higher level, experientially as well as topographically, than I at least had ever undertaken. 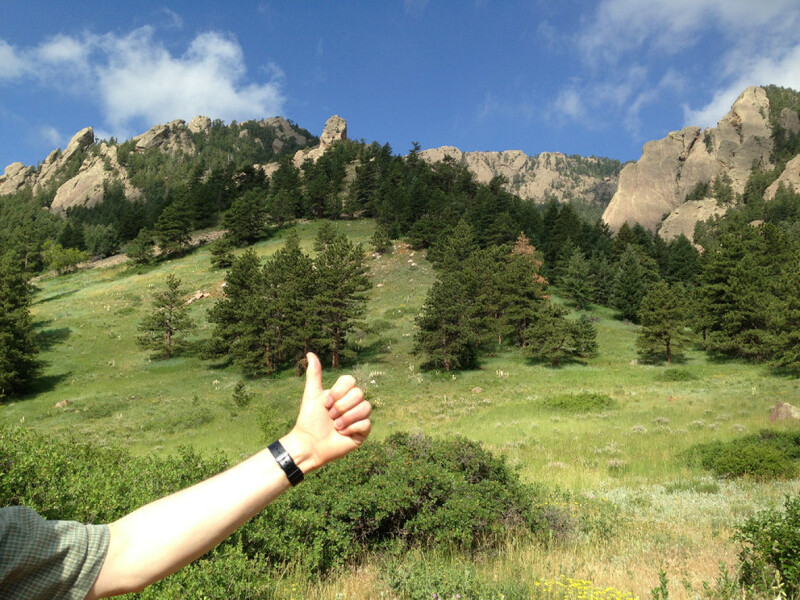 Getting into the Flatirons, along with the Enchanted Mesa, Skunk and Gregory canyons, and other wild areas near the Chautauqua, has made a nature lover out of me. After recovering from the morning hike, it’s a big lunch downtown (may we recommend Brasserie Ten Ten, where we ate every day during our 2007 stay?). 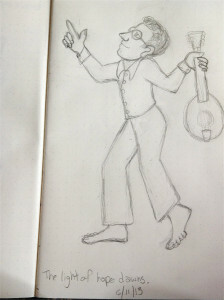 A sketch of Doug perceiving the light of hope (read: time to start our vacation) by Gretchen for her 2013 travel journal. Schaefer Studios. Back up the hill at the Chautauqua, with the entire compound observing quiet time until 3 p.m., we settle down to some work. For Gretchen, in recent years that has involved entries in an animated digital journal, very funny, that she creates on an iPad. For me, it’s reading, preparing new material for the band or songwriting. For dinner, we fix something light in the cottage or go to the Chautauqua Dining Hall. And in the evening, nearly every evening, we learn a new song and review the previous nights’ work. All in all, as I said, heaven on earth. That first year, we picked up four or five from the Louvin Brothers’ Ira and Charlie, the LP that prompted, or at least coincided with, our decision to narrow Day for Night’s focus even tighter on country music. We drank Jack Daniels from Rose Hill Wine & Spirits, down in the quarter where the college students live. We played inexpensive Alvarez guitars rented from Woodsongs, a music store out in the mall zone. For nonprofessionals like us, learning a song per night is a workout, but a happy one. As anyone knows who has the discipline or luxury to swim deep in the waters of their occupational calling, doing so simply feels wicked good on your brain. And the more you do it, the better you get and the better it feels, at least up to the point where you’re doing speedballs on the tour bus. 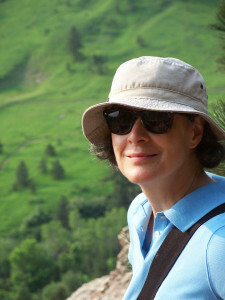 Gretchen on the trail in a green year for Boulder. Hubley Archives. Boulder established our practice of traveling musically, and we have done so in other destinations, including a dank mildewed rental house in Guerneville, Calif., and the aptly named Paradise Inn, in Bennington, Vt. But Boulder is always better, musically and in every other way. 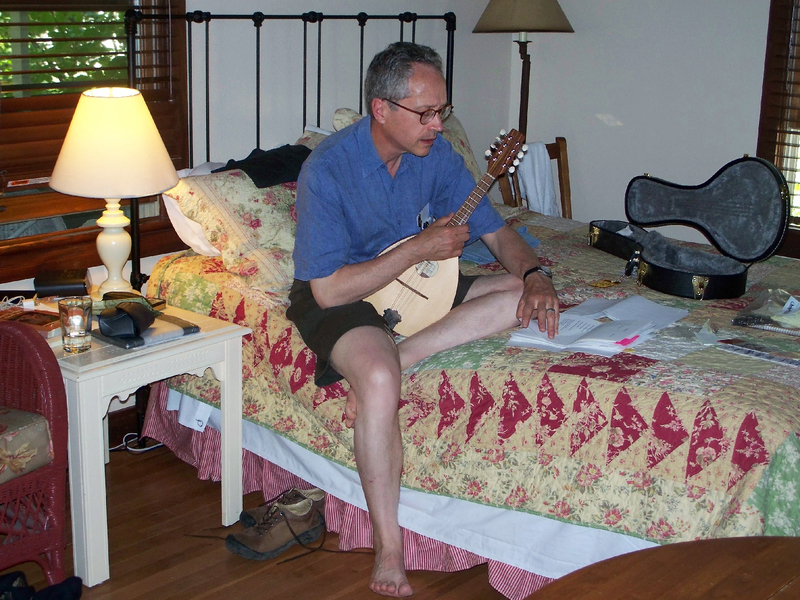 In 2010, while visiting Woodsongs to transact the usual rental of two blister-raising cheap acoustics, I wandered over to a wall display of mandolins and plucked at a couple — I still remembered two or three of the four chords I’d learned back during my mando flirtation back in the 1970s. Just how much beauty can there be, after all? Hubley Archives. I spent a few minutes at it. I was assessing mandolins. I had just gotten a raise. I felt the flush of that strange mental inflammation that comes with the knowledge that you are about to lighten your wallet. Sure enough, after a few other errands, we doubled back to the music store and I bought a Big Muddy MW-O, a mid-priced A-body mandolin. The Front Range, 2015. Hubley Archives. And while I’m still no Ira Louvin on the mandolin (or in any other way, for worse and for better), that instrument did renew our perspective on a musical direction. In the interest of simplicity, overboard went all the accordion and autoharp numbers. This had the effect of focusing the repertoire both sonically and stylistically, since some of the cuts, even some very cool songs that we played well, seemed increasingly out of place as our sound got more country. Cutting those two instruments also streamlined performances, since they were both hard to mic, and also, of course, fewer instrument changes make for a better pace. The meadow and a Flatiron from the back yard of Cottage No. 19. Hubley Archives. 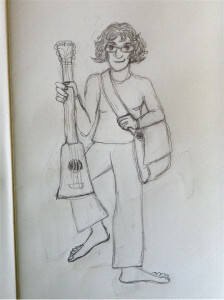 So in that sense the mandolin concluded another developmental phase for our little band. We had previously realized we couldn’t be the Howling Turbines without a drummer, that bossa nova and country just don’t mix, that we had to focus tighter on country. 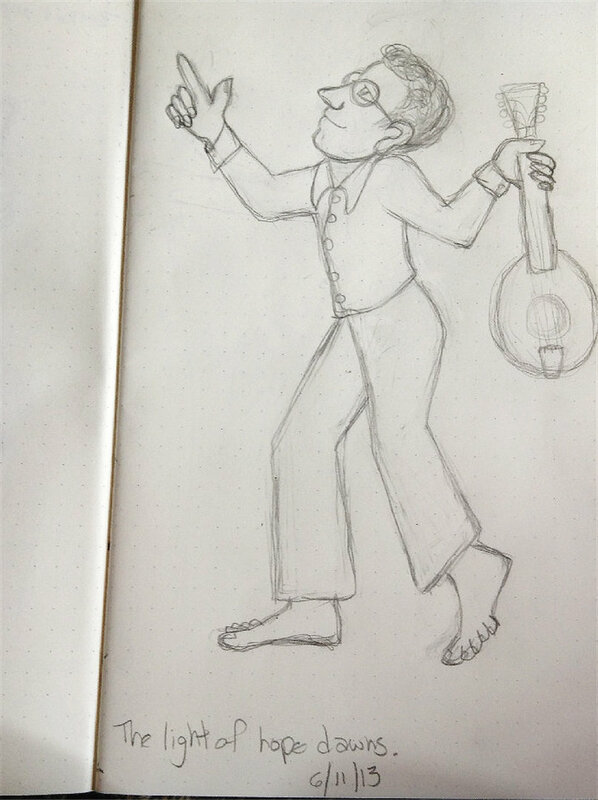 And now, pulled by Ira and Charlie and a Missouri-made mandolin, we were about done with the gain and loss, and ready for some pure gain. In addition to Boulder’s countless charms, I think, it’s also true that the founding impulse of the Chautauqua movement — self-elevation through a judicious harmonizing of nature, rest and mental stimulation — has played a meaningful role in Day for Night’s Boulder experiences. In ways greater and smaller, we have always returned from Boulder a better band than when we got there. Of course, we could also say the same about Cornish, Maine. 1. You Wore It Well (Hubley) Begun in a hotel in Portsmouth, N.H., and completed in Cottage No. 19 at the Colorado Chautauqua in 2013. Now a regular part of the D4N repertoire. 2. Just a Moment in the Night (Hubley). This started out as an entirely different song that I may yet write. Completed in Cottage No. 417 at the Colorado Chautauqua in 2015, one of two originals for 2015. Two whole songs in one year! I’m a one-man Brill Building! “You Wore It Well” and “Just a Moment in the Night” copyright © 2015 by Douglas L. Hubley. All rights reserved. View from the Chautauqua Meadow, Boulder, Colo., June 2013. Schaefer Studios. Notes From a Basement text copyright © 2012–15 by Douglas L. Hubley. All rights reserved.